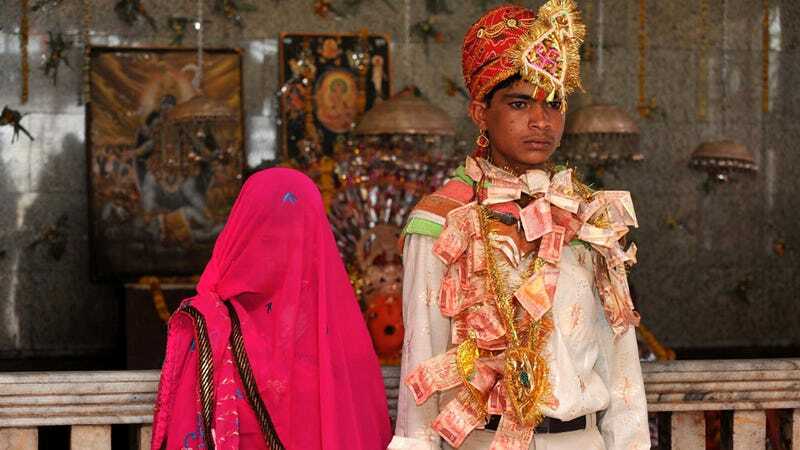 Laxmi Sargara, an 18-year-old girl from India who was entered into an arranged marriage when she was just a year old, made the brave decision to fight against her forced union, and now she's won an annulment. While child marriages are technically illegal in India, many families in rural communities still engage in them for financial reasons. Typically the young girl continues living with her family until she reaches puberty, and then an elaborate ceremony is held (like the one pictured above). In the case of Sargara, who is from the desert state of Rajasthan, she was married at age one (or sold, depending on how you want to look at it) to a boy named Rakesh, who was then three. Of course, since she was a toddler, she had no idea the "wedding" had taken place until she got older. When she learned of it, she says, "I was unhappy about the marriage. I told my parents who did not agree with me, then I sought help. Now I am mentally relaxed and my family members are also with me." That's a relief, indeed. Help came from a social worker in Jodhpur named Kriti Bharti, who runs the Sarathi Trust, which lobbies for children's rights. Bharti helped Sargara negotiate with Rakesh and his family and persuade them that the union was unfair. Rakesh at first objected to ending the marriage, but after he realized Sargara was so fiercely opposed to it, he changed his mind. The marriage was annulled with a joint legal document, which should ensure that Sargara doesn't have any problems with it in the future. Bharti thinks Sargara's bold move sets an excellent example of what is possible: "It is the first example we know of a couple wed in childhood wanting the marriage to be annulled, and we hope that others take inspiration from it." Other activists hope it will be the first step in changing the entire culture of child marriage.